We’ve just put up the first of major changes to how-to-build-websites.com. It had been a long while since I did any work on it, and it was needed. For now, you will find a whole new look and feel that cleans up the site and brings it into harmony with the other websites on the killersites network. – tips and tricks articles. How does a web facelift impact traffic? How you ‘skin’ a site can have a major impact on your traffic. 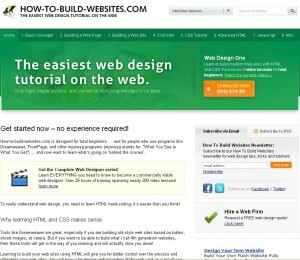 Case-in-point: how-to-build-websites.com. We’ve immediately seen a big increase in the page views and in the visits to the site. The most dramatic was the page views though – nearly 3x as many!! This entry was posted on Thursday, February 24th, 2011 at 11:08 am	and is filed under HTML Videos, News, Web Design. You can follow any responses to this entry through the RSS 2.0 feed. Both comments and pings are currently closed.